Quidsi, parent company of Diapers.com, launched a new site today, Soap.com, with the promise of lower prices for common household goods and free 2-day shipping (for orders over $49). To up the ante over its competitors further, Soap.com claims that free overnight shipping will be available for over 70% of the country. Soap.com is launching with more than 25,000 products from more than 900 brands across a wide range of health, beauty, personal care and household categories. To put this in context, Soap.com says the average neighborhood drugstore has just 10,000 items. 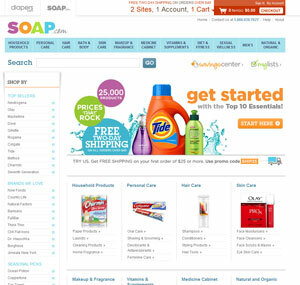 Soap.com plans to offer more than 40,000 products by the end of 2010 and more than 100,000 by the end of 2011. According to Quidsi CEO Marc Lore, "[Soap.com is] out to change the way people shop for their everyday essentials." That is, rather than going to the drugstore to pick up you're toilet paper, we will naturally turn to Soap.com and order these products online. Of course, this has been done before. Drugstore.com has been in operation for more than 10 years, offers free shipping for orders over $49 and has more than 50,000 products on site. And many of the brick-and-mortar drugstore chains, such as CVS, have established their online presence. When I did a quick compare of pricing across Soap.com, Drugstore.com and CVS.com, there was no clear winner (see chart at bottom of article). So, at least for now, Soap.com does not have an overall price advantage. But none of the other sites is offering the free 2-day shipping that Soap.com offers. And Soap.com claims that over 70% of the country (including NYC!) will receive their shipments overnight, if ordered by 6pm. That's huge when you consider that Drugstore.com standard shipping is 4-7 days and CVS standard shipping is 5-10 days. When you're running low on toilet paper, delivery in the next week or two just isn't going to cut it. You're going to head out to the drugstore or Costco and pick some up. Delivery tomorrow or the next day? That may be enough to change your behavior. And that is what the founders of Soap.com are betting on. Great idea. I’m surprised that identical products are cheaper, too! I think it would be even more useful if they could set up some sort of periodic ordering system. For example, every month I need a new bottle of shampoo. Every 3 weeks I need to change my toothbrush. New sheets every 3 months. It would be great if these things just automatically showed up at my door when I need them.